Great project for teen girls at craft tent they loved making the bracelets in their own style. This works best if you have a hot glue gun to glue the ends down the white glue provided takes 20 minutes to dry. We also had a hard time getting the connectors in but the jute wrapped around the plastic tubing easily. I think you could get the same effect using different materials. Nice quality craft - you will need to fix the dents in the tubing by pinching the kink. 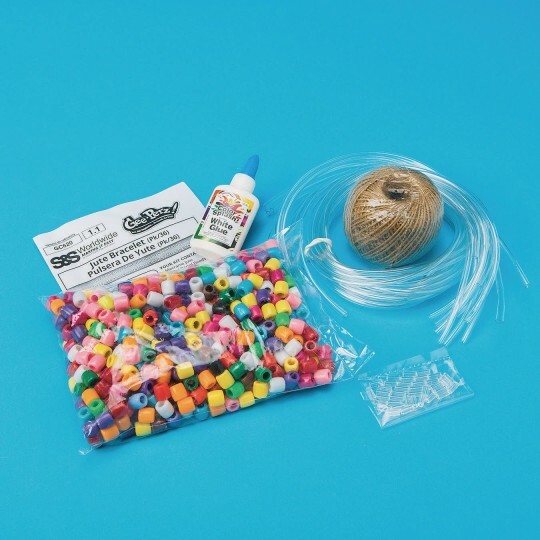 This product looks great when done by older teens/adults. 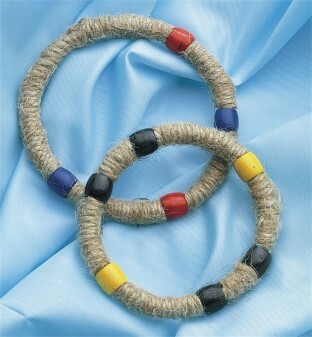 Not for younger children as it is difficult to keep the jute taught and add beads at the same time. The tubing was kinked in at least one place on each bracelet causing the finished product to be egg-shaped. If a bead is centered over the kink then the bracelet can turn out more round. All those who tried to make a bracelett were excited about the concept initially but younger children were quickly frustrated. The connectors didn't hold the tubing together on some bracelets and required glue gun.